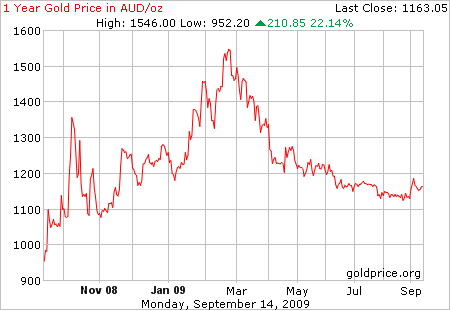 As you can see, despite the rise in US dollar terms, gold in Australian dollar terms has gone down from above $1500 to under $1200 in a little over six months. Therefore, any jeweller using the current gold price as an excuse to charge you more is full of it! Anyway, with the current gold “fever”, a lot of “gold bugs” in the US are suggesting ways to invest in gold. One way to invest in gold is through The Perth Mint, as they store gold for free, are backed by the WA government and issue a pretty certificate. So I decided to look on their website and found out they sold bullion at 3% above the current spot price. However, when I looked at what our gold supplier – Morris & Watson charges for fine gold granules (99.9% pure), it was a lot cheaper than The Perth Mint. In fact, it was almost the spot price of the day. This means that making our own fabrication alloys works out to be about 50% cheaper than buying it off the shelf from some of the larger refiners. This entry was written by Nikhil Jogia and was posted on on Tuesday, September 15th, 2009 at 8:25 pm	and is filed under Buying Advice. You can follow any responses to this entry through the RSS 2.0 feed. You can leave a response, or trackback from your own site.